This is Elite edition series of Cuisinart 14 cup food processors. Its an upgraded version of the 1.0 version and offers additional features along with better build and design. To see enlisted feature head over to Amazon and also for detailed review read below as well. It comes with 2 bowls a 14 cup and a 4.5 cup bowl. You can remove the smaller one and operate with the large only. Its versatile and is beautifully designed. Unlike other models it actually has a die-cast base and can make your kitchen counter look thoroughly professional and elegant. The plastic is BPA free and measurements are marked on the bowls so you can keep track of how much you are working on. Small holes are available to pour in the liquids for recipes like mayo. The touchpad comes with 4 buttons of ON, OFF, DOUGH, and PULSE. The touchpad has LED lights which shows you the mode of operation when used. As with other Cuisinart food processor safety is also prioritized in this elite model but also made easier to unlock with a release button. FP-14DCN works quietly and you can operate it while your kids are taking a nap. The machine comes with a variety of blades and also a single drawer to hold them. The good part is the blade locking system that makes sure that your safety is not compromised. Cuisinart has made the ingenious method to adjust the slicing blade thickness. You can alter it to 10mm and can make you desired even resulted in slices. Both bowls have their own S-shaped blade. In addition, it comes with the black color dough blade, shredder blade, adjustable slicer to select desired thickness. The feed tube is very large and you can put in veggies or cheese block without the need of pre-cutting. However, it would be a good idea to freeze the cheese before shredding to avoid sticky build up on the blades. If you want to make celery then you need to use the smaller tubes that will hold the carrots or radishes in an upright position. The powerful heavy-duty motor can do all basics 6 tasks of quick shredding, slicing, kneading, emulsifying, pureeing, mixing. After all, this is a premium elite edition carefully engineered by Cuisinart. You will get a Spatula designed especially for FP-14DCN in addition to the recipe book to be a chef. The power chord is retractable that means it automatically goes back into its case once you take it out from the socket. You can learn to use this machine more efficiently with the recipe book that is included with the packaging. Cuisinart has put a lot into this machine and has introduced the SealTight technology. If you have used inferior models or low-end processor then food particles coming out or leaking from the bowl won’t be a surprise for you. Cuisinart has changed that with SealTight and not even a single whiff of flour can escape the bowl. In addition to SealTight, it also includes the reversible blade technology as well. Do not be surprised it is Elite Edition 2.0. Its very easy to clean with hands there are not hidden crevices. The machine is made safe for the dishwasher but does keep in mind that dishwashers with their rigorous methods can make the bowls become cloudy with the passage of time. Since Cuisinart food processors are optimized for protection you might find it hard initially to lock the machine. The key is to match the bottom notch with base and with anticlockwise rotation lock it and the handle would come to the center of the base. 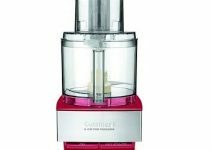 FP-14DCN Cuisinart 14 cup food processor is encased with a Very powerful motor with 1300 watts massive power single phase induction motor with a very strong stator and rotor winding which is the reason behind 20 years motor warranty. Die-cast base makes it heavier to lift. Its current price is very justified keeping the machine build and versatility in mind. Previously only Breville had the machine to adjust the slicing thickness but with the advent of Cuisinart to have this features Cuisinart has taken the lead. If you learn to use the machine properly by reading the user manual that comes in the packaging you can save yourself from the food build ups on the disks.The die-cast finish adds to it beauty. Check if its available in the stock and order your unit and make life easier.